Hunt for all the paddles and vote for your favourites! The canoe paddle was chosen as a symbol that reflects Bobcaygeon's heritage as a main waterway route for both First Nations and settlers. And these are beauties! Local artists made a special effort to create work that represents favourite aspects of our village. We owe a big thank you to the Impact 32 Vibrant Village team (formerly the Beautification team) for their imagination in coming up with the idea and for the hard work of organizing and hanging the stunning result. Take a stroll around town to find every one of the 71 paddles on display, and be sure to vote for your favourites in two categories 1) Most Vibrant, and 2) Your Favourite. It's easy to vote online using the button below, or you can pick up a paper ballot and vote at Kawartha Coffee, or Zen Den, or Pick 'N Save, or the Impact 32 Welcome Centre. The paddle with the highest vote count wins bragging rights! Impact 32 could not have made such a welcome addition to our streetscape without the time and talent generously donated by Bobcaygeon's 71 paddle painters. Our town is in awe of the work you've done and abuzz with compliments this summer. There's a fresh spring in the step of many Bobcaygeoners thanks to some exciting plans for this summer. Impact 32 is working together with the Chamber of Commerce, the Horticultural Society, and Environmental Action Bobcaygeon, and involving all local volunteer groups, businesses and residents to make sure the town is at its most beautiful for a visit from the Ontario Communities in Bloom judges on July 11th and 12th. Based on other communities' experiences, benefits to Bobcaygeon will be significant. Enhanced economic development (tourism, hospitality and retail) along with marketing and promotional opportunities. The Bobcaygeon Communities in Bloom team is asking everyone to work together and help put our best foot forward this summer to show just what a vibrant village Bobcaygeon is. Community participation from all ages and walks of life is encouraged. The new Bobcaygeon Communities in Bloom website, www.bobcaygeoncommunitiesinbloom.com, has more information about the program as well as a volunteer sign-up form and photo-highlights of the village's proudest moments. You can contact the team by email at bobcaygeoncib@outlook.com. Impact 32 has received funding for a temporary position under the Canada Summer Jobs Program. We are looking for a student to look after the bike share initiative, greet visitors, and take on other tasks that benefit our community. Impact 32, a Bobcaygeon volunteer organization, is looking for a student Service Co-ordinator to work 30-hours per week, at $14 per hour, for 8 weeks, from June 25 to August 17 under the Canada Summer Jobs Program*. This position requires meeting visitors to our area and providing information and assistance on what they might like to see and do, managing a small bike sharing center, as well as a wide variety of other tourism-related duties. A large percentage of the time will be spent outdoors. Knowledgeable of Bobcaygeon and interested in our history. Qualified applicants should send their resumes with a cover letter to Impact 32 at visitbobcaygeon@gmail.com by midnight May 22, 2018. Because of limited volunteer resources, only those selected for interviews will be contacted. What's Open on Easter Weekend in Bobcaygeon? Closed Friday, Closed Sunday, Open Monday 12:00 noon to 6:00 p.m.
Normal collection during the week of Monday April 2. Closed Friday, Closed Sunday, Open Monday 9:00 a.m. to 5:00 p.m.
Closed Friday, Closed Sunday, Open Monday 8:00 a.m. to 5:00 p.m.
Open Friday 9:00 a.m. To 5:00 p.m., Open Sunday 9:00 a.m. To 5:00 p.m., Open Monday 7:00 a.m. To 9:00 p.m.
Closed Friday, Closed Sunday, Open Monday 7:00 a.m. To 9:00 p.m.
Congratulations to the 2018 FrostFest Snow Sculpture Winners! AND THE IMPACT 32 FROSTFEST SNOW SCULPTURE WINNERS ARE . . .
Claire Kimble-Mahoney, #50 Local Sweet Treat, awarded $100 prize. Robbie Livie, #19 Sea Turtle, awarded $100 prize. Congratulations to John and Robbie and Claire, well done and an excellent job of getting the votes in. Because of the tie recorded at exactly midnight, Impact 32 is awarding one extra prize this year so both Claire and Robbie receive $100. Happy Family Day! Yesterday at Lock 32 Park, we not only saw many talented snow artists in their element, but we also witnessed several skilled dancers who rose to our Family Day Dance Challenge. We hope you enjoy this highlight reel. 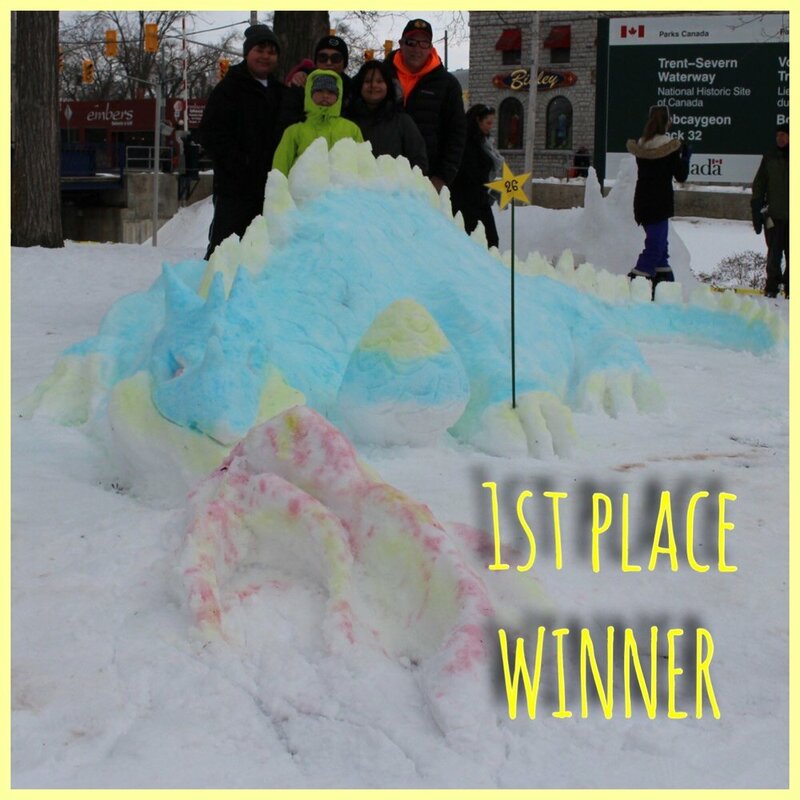 Be sure to go to the FrostFest 2018 photo album on our Impact 32 Facebook page to vote for your favourite snow creations. Two winners will win a $100 Gift Certificate to the Bobcaygeon business of their choice. Deadline for voting is midnight on Friday February 23rd, 2018. A big Thank You to our own Catherine Pentiricci for producing this upbeat happy video! 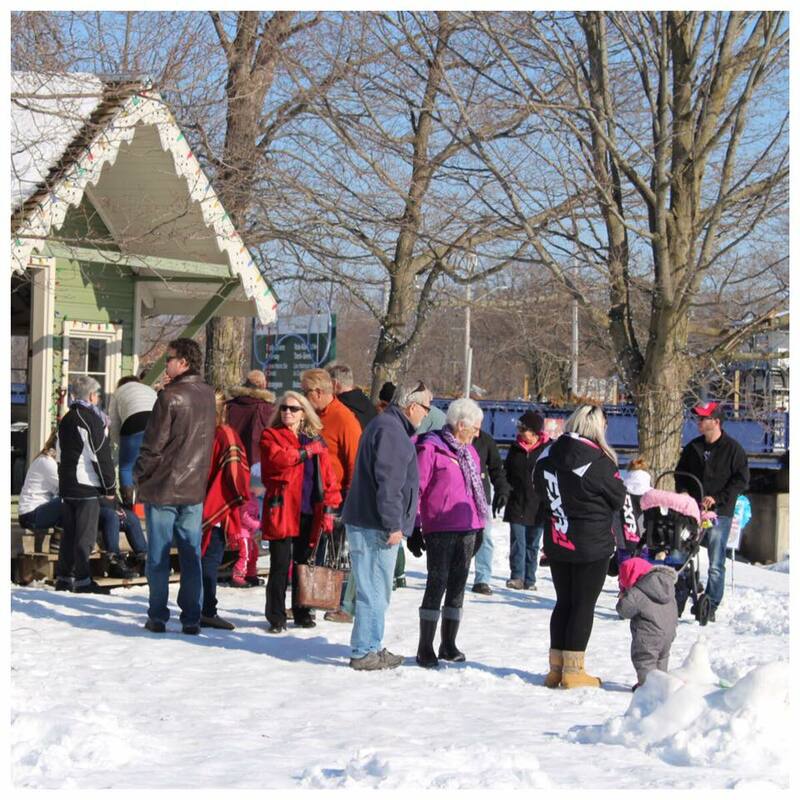 What's Open on Family Day in Bobcaygeon? Wondering what's open in town on Monday, February 19, 2018? You don't have to be an artist, you just have to want to get outside and have some fun. Snow sculpting is a great social or family event. A group can create a sculpture together and an audience can watch as you work. The lifetime of snow art depends on the weather, but we'll be taking pictures of your masterpiece at its best! Stay warm and dry with a warm coat, snow pants and hat. Bring spare mittens and gloves. Rubber gloves will help keep your hands dry, and some sculptors like to wear knee pads for comfort while carving. Sunscreen on your face is a good idea. Search your computer or books or magazines to get ideas. Pick one and bring a picture of it, or make a sketch and bring that. It will help you stay on track, especially if it's a group project. Fun and easy is best for first-timers! Shovel the snow you think you might need into a mound. Stir it up a bit to warm the snow and remove excess ice chunks so it's easier to work with. We're all sharing the available snow, so please just shovel up as much as you'll need. To make the foundation, use your hands to pack each layer of snow down hard before adding more. A strong base will keep your design from collapsing. Sometimes sculptors pack the snow into a cardboard box and then remove the box and carve away the extra snow. Remove the excess snow to make a rough outline of your basic shape. First start carving snow away at the top on the more fragile parts, then work toward the bottom. Have fun finding tools to carve and decorate your masterpiece. How about -- garbage can lids, milk cartons, spatulas, chisels, ice cream scoops, you name it! in your hands, then use it to build up parts of your sculpture. - Try putting some water into a spray bottle and spritzing the snow. - We've got spray bottles at the registration booth for you to borrow. You can also use wet slush as 'glue' to attach additions to your sculpture. If you want to add colour to your snow sculpture, just mix food colouring with water and spray or pour it on. It might take several coats -- and could make it melt faster. When your snow sculpture is finished, you can lightly spray water all over your masterpiece to glaze it. Blessed with perfect weather, last year's FrostFest brought large crowds and more than 50 snow sculpture entries. Families and visitors enjoyed gallons of hot chocolate and hundreds of homemade cookies donated by local businesses and volunteers. Impact 32 volunteers had a good time too, running fun games with prizes for every child, and mascot Bobbie Constellation's visit to FrostFest was a special highlight. This year FrostFest is again located at the park at Lock 32 beside the swing bridge, and Impact 32 is again offering prizes for your engineering marvel! Enter as a 'Family/Group' to win one of two $100 gift certificates, or as a 'Businesses/Community Organization' to bag bragging rights and good Family Day karma. Gift certificates are redeemable at the Bobcaygeon retailer of your choice. 2017 Expert Auction Another Great Success! As parties go, this is a good bet. You've got a great venue, the Arts Barn; you've got lively entertainment, local people on the auction block; and you've got the excitement of winning your bid and coming home with something special, even unique. All for a worthy cause. This year's Bobcaygeon Expert Auction did not disappoint. Final calculations are almost complete for this dock building fundraiser, and it looks like another stellar year! Thank you to all the people who made this happen. Thank you to all who attended. Without you, it wouldn't work of course. You gave back to our community – and it sure looked like you were having fun! Thank you to all the good sports who ruled the stage while “the crowd went wild”. Thank you to the businesses who donated gifts and services for the silent auctions. Thank you to our super Auctioneer Jason McIntosh, you made us dig deep and feel great about it. Thank you to the Westerby Entertainment DJ, you kept it lively. Thank you to Danielle Thompson, Master of Ceremonies, you made sure we had fun and knew what we were bidding on. Thank you to the Lakeview Arts Barn, a wonderful party venue as always. And thank you to J & K DeVitt transport. Thank you to the folks who sold tickets at Kawartha Coffee, My Favourite Things, Darling Insurance and LiveWell. Last but not least, thank you to the volunteers who came to meetings and organized everything. Thank you for hanging posters, for canvassing businesses for donations, for selling tickets, for decorating the Arts Barn, for taking the photos, for running the games, for manning the ticket and cash-out table, for setting up the silent auction tables. For all of this, and for the many laughs shared all along the way! Time for our Winter Wow! Impact 32 volunteer Jamie Henderson is thinking about winter. No, not that, in a good way! His crew has taken down all the flower baskets from Bolton and King Streets and prepared them for winter decorating. They looked pretty good this year, right through early November (see photo on right). Sunday, November 12th, from 11:45 to about 4 p.m.
Meet at the Impact 32 Welcome Centre/bike station beside the swing bridge. Snacks and beverages will be supplied. We hope to see you there. Last year's crew did a beautiful job and had an enjoyable time outdoors while they worked. You don't have to be a gardener or artisan, the pots are very easy to put together. Bobcaygeon Businesses are the Best! More than 60 local businesses have donated auction items or prizes for the fast-approaching November 4th Expert Auction! Impact 32 volunteers want to extend a sincere thank you for helping raise funds to build more docks. A dock shortage in a lock-side town is a bit like a supermarket with a too-small parking lot – people get frustrated and have to go elsewhere. Of course that kind of lost opportunity isn't good for anyone. Prosperous businesses and their related jobs make a thriving town. A vibrant community with lots of shops and services adds enjoyment for all residents, attracts investment, and safeguards our property values. Now is the time for everyone to help by buying tickets and coming out to the Expert Auction on Saturday. Join and support your friends and neighbours at this very friendly social event. The evening is designed for fun. All the experts don their expert gear and when they start to demonstrate their expertise . . . let's just say you can tell they really love their work! Come out and cheer on your favourite Bobcaygeon businesses! You don't need deep pockets to join in the fun. Whether you bid on the more than 20 experts on the auction block, or play the games for prizes, or bid on the dozens of silent auction items, it's all fun and games, and you're sure to find something you love for yourself or for a Christmas gift. Get your tickets at My Favourite Things, LiveWell, Darling Insurance and Kawartha Coffee. More information about this community fundraiser are on the Impact 32 website Events page. Impact 32 wants to thank and acknowledge the following businesses for this year's generous contributions of experiences and prizes for you to bid on and win -- and more donations are still rolling in! Look Who's on the Auction Block...! This year's Expert Auction is going to be full of fun, full of excitement, and full of surprises. In fact ... it's going to be very full. We're overflowing with auction items and prizes donated by Bobcaygeon businesses to raise funds to build more docks. Today we're releasing just a few to show you what we mean. Let's talk about interactive experiences first. Here's one for all the beautiful ladies who will be attending the November 4th gala evening. Cosmopolitan Salon and Spa is on the auction block offering a dreamy new hair style, professional makeup application, and sparkly fresh manicure. Oh, (as if that's not enough for your Big Night Out this holiday season!) – one more little thing, we're throwing in a really really big box of Shiseido luxury products, all for you! Not quite sure which yoga class is best for you? Bid on “Passport to Prana” and you'll soon be setting off on the right path. Six of our local expert yoga instructors will invite you to one free class each, so you can savour each experience and decide if one might be a perfect fit for you. Sweet! Kawartha Honey's Bee Yard and Honey House tour will reveal the secret world of beekeeping. This is a once in a lifetime experience that true honey lovers will remember for a long, long time. Did you hear that Town & Country Decorating is joining Good Pickins to offer a class for four people to learn to renew and restore furniture and go home with beautiful Cottage paint, varnish and special paint brush? Let us not forget, Bigley's is back! Now here is a perfect gift any woman would truly appreciate (hint hint) – a personal shopper and gift certificate from the store we ladies have learned to love. Do you know somebody who's a born comedian? This year they'll be LOLing when you give them the gift of laughter. Jennine Profeta & Dave Pearce present a 60 minute Happy Hour Improv Workshop (great for couples or a girls nite out). Learn the secrets of improvisational comedy the way they do it on Whose Line is it Anyway? Or maybe you secretly want to be a morning radio host. Don't we all – but now you can! You just have to bid on this expert experience and presto! You're on the morning show with Country 105. Moving right along, have we got prizes for you! The good merchants and businesses of Bobcaygeon have outshone themselves this year. Peace of Earth has created a gorgeous hand-made pottery plate, bowl and cup just for you. Garden Art by Sandy has created three pieces for the Impact 32 Expert Auction, a beautiful free-standing heron and two darling garden-variety birds. A blend of metal and rock give her quirky creations a rustic and natural look. Jermyn Lumber is going to make sure you and your better half are cozy this winter in His & Her Heated Jackets. Did we say “Leaf tickets”? We've got a pair of the very best and you might come home from the Expert Auction with them in your pocket thanks to Darling Insurance. And if all that doesn't take the cake, how about Cake by the Lake baking five amazing cheesecakes just for you. Mmm, right, one for Christmas, and Easter, and Thanksgiving, and Canada Day and what the heck you deserve one more of those scrumptious beauties for your birthday. Impact 32 has so many auction items and prizes, we can only talk about a few at a time. Stay tuned for more announcements next week. Meanwhile, you'd better get your tickets right now. Tickets are available at My Favourite Things, Kawartha Coffee, Darling Insurance and LiveWell. What is the Impact 32 Expert Auction? Impact 32 can't wait to reveal the details of some very hot items now added to the November 4th Expert Auction (and party!) at Lakeview Arts Barn. If you've ever wondered how to transform 'so-so' furniture to 'so stylish', Good Pickins and Town and Country Decorating Centre will teach you and three friends how it's done. You're on your way to unveiling the mysteries of renewing and restoring your furniture when you win this new auction item that includes a painting class, Cottage Paint, varnish, and a Cottage Paint brush to take home! We know a great way to thrill your sweetie and keep her warm this winter. Expert knitter and owner of Granny Bird's Wool Shoppe, Julie Anderson, is contributing a luxurious hand knitted fashion-forward shawl. This one-of-a-kind wondrous gift, all soft and gorgeously cozy, is sure to tickle the fancy of a special lady. Speaking of great gifts and someone who loves a sweet little thing or two, how about a dozen tarts and a $100 gift certificate from Bobcaygeon Bakery? We're sure we heard those famous buttertarts whispering your name. And we've got snappy-hot Improv talent you can bid on too! Jennine Profeta & Dave Pearce will present a 60-minute Happy Hour Improv Workshop (great for couples or a girls nite out). Learn the secrets of improvisational comedy the way they do it on Whose Line is it Anyway! This year's expert auction is shaping up to be the hottest ticket in town and we're lining up more prizes and auction items as we speak . . . be sure to pick up your tickets at Kawartha Coffee, My Favourite Things, Darling Insurance or LiveWell. Here's where to find out more.